Gonzâles Palencia, Madrid, Instituto Miguel Asln, 19532. Wissenschaften. Die Version des Dominicus Gundissalinus, Lateinisch —Deutsch. «Hermes Latinus» IV, 4), p. 285-347. ARISTOTE, Fragmenta, hrsg. von Valentin Rose, Leipzig, Teubner, 1886. Aldershot, Ashgate Variorum, 1996, n° XV]. del Galluzzo per la Fondazione Ezio Franceschini, 2006]. centuries, ed. by Christopher Dawson, London, Sheed and Ward, 1955.
and David Morgan, Indianapolis (IN) —Cambridge, Hackett, 2009. James F. Dimock, London, Rolls Series, Vol. VI, 1868. Wissenschaften zu Berlin, Bd. LUI). M. Lindsay, Oxford, Clarendon Press, 1911.
instruxit Clement C. I. Webb, Oxford, Clarendon Press, 1909 (réimpr. avec une introduction pax Patricia McNulty, New York, Arno Press, 1979). JusTE, David, Les «Alchandreana» primitifs, Leiden —Boston, Brill, 2007. Tokyo, Princeton University Press —University of Tokyo Press, 1968. Science, 1896 (titre original :The Secret Common-Wealth, 1692). littéraires du Moyen Âge 27 ;Divinatoria 3). 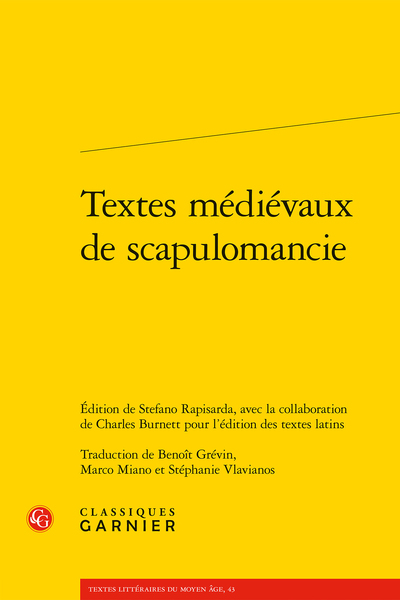 144 C ;série «Hermes Latinus » IV, 4), p. 263-272.
mediaevalis » 144 C ;série «Hermes Latinus » IV, 4), p. 273-283. Rapisarda e Rosa Maria Piccione, Roma, Carocci, 2005.
a cura di Stefano Rapisarda, Roma, Carocci, 2009. 2015 (Textes littéraires du Moyen Âge 35 ;Divinatoria 4). Muhammad Muhsin Khan, 9 vol., Medina, Islamic University, 1990-2010. Folklore, 6 (1895), p. 162-171.
irlandeses », Anuario brigantine, 21 (1998), p. 67-76. Media, 17 (2003), p. 27-42.
ed. by Berthold Laufer, New York, Stechert, 1906, p. 143-165. King of Morocco », Al-Andalus, 25 (1960), p. 373-381. Charles R. Bawden, Wiesbaden, Harrassowitz, 1994, p. 143-160]. secolo xII », Studi di filologia italiana, 57 (1999), p. 1-32. 1928. vol. 6, p. 71-89. State University Press, 1992, p. 165-167.
in the Middle Ages, Aldershot, Ashgate Variorum, 1996, n° XIII]. Divination in the Middle Ages, Aldershot, Ashgate Variorum, 1996, n° XIV]. Variorum, 1996, p. 1-14, n° XII. Romanes, 38 (1895), p. 27-28. Turnhout, Brepols, 2013, p. 143-153.
dans l'Occident médiéval, Genève, Droz, 1980.
animaux domestiques, Paris, Baillière, 1857. The American Journal of Philology, 129 (2008), p. 319-345. École Nationale des Chartes, 2001-2002. Zeitschrift, 98 (2005), p. 5-21. Zeitschrift, 100 (2007), p. 605-623.
l'École des Chartes, 1955, p. 10-32.
to Texts and Manuscripts, London, Anglo-Norman Text Society, 1999. (MD), National Security Agency —Central Security Service, 1978. Divination et rationalité, éd. par Jean-Pierre Vernant, Paris, Seuil, 1974. Fernandez, New York — Houndmills, Palgrave Macmillan, 2007, p. 47-65. Internationales Archiv für Etnographie, 35 (1938), p. 49-116. School CNWS, 1997, p. 43-76.
le milieu natif de l'Islam, Paris, Sindbad, 1987 (ire édit. Leiden, Brill, 1966). yacimientos medievales », Al-Qantara, 18 (1997), p. 271-294. Anthropology, 49 (2008), p. 403-437. Heinz Halm, begründet von Ulrich Haarmann, München, Beck, 2004.
au Moyen Âge, Paris, Classiques Garnier, 2010 (Sagesse du Moyen Âge 1). Helmuth Schneider et al., 2003, Stuttgart, Metzler, vol. V, p. 1006-1007. Princeton, Princeton University Press, 1990). New York, De Gruyter, 2004. Lincoln 1235-1253, Cambridge, Cambridge University Press, 1940. (MASS. ), Harvard University Press, 1927. Folklore, 19 (1908), p. 315-323. Johannitius », Traditio, 43 (1987), p. 121-145. Anthropologist, 59 (1957), p. 69-74. Bronze Age China, Berkeley, University of California Press, 1978.
the Latin Middle Ages », Traditio, 31 (1975), p. 99-126. Texts and Manuscripts », Italia medioevale e umanistica, 19 (1976), p. 57-87. Madrid, Maroto e Hijos, 1880-1882. MERISALO, Outi, «The Early Tradition of the Pseudo-Galenic "De spermate"
(Twelfth Thirteenth Centuries) », Scripts, 5 (2012), p. 99-109. Green, 1886 (lre éd. 1843). MONTELL, G~sta, «Torguts of Etsin-Gol », Man, 37 (1937), p. 113-114. NICOLAISEN, W.F.H., «A Gleaner's Vision», Folklore, 106 (1995), p. 71-76. Transactions of the American Philological Association, 108 (1978), p. 121-130.
russe et presenté par Dany Savelli, Besançon, La lanterne magique, 2010. Smith, Aldershot, Ashgate Variorum, 2004, p. 55-85.
and Chrirtianity, 100 BC to AD 200, Oxford, Oxford University Press, 2008.
altre lingue romanze medievali) », Medioevo Romanzo, 32 (2008), p. 38-67. Danielle Buschinger, G~ppingen, Kümmerle, 1991, p. 419-434. Studies, 23 (1992), p. 57-62.
the International Reynard Society, 24 (2011-2012), p. 152-182.
to Omar Khayyam Moore », Arctic Anthropology, 18 (1981), p. 95-103. Anthropologist, 35 (1933), p. 134-137. The Biblical Archaeologist, 53 (1990), p. 205-209. VOLLWEILER, Lothar Georg — BANCHEZ, Alison B., «Divination : 'Adaptive"
from Whose Perspective? », Ethnology, 22 (1983), p. 193-209. Mediaeval Studies, 27 (1965), p. 54-90. Movement, Washington D.C., Smithsonian Institute, 1989, p. 19-60.
the University of Chicago, 2010, p. 177-197.